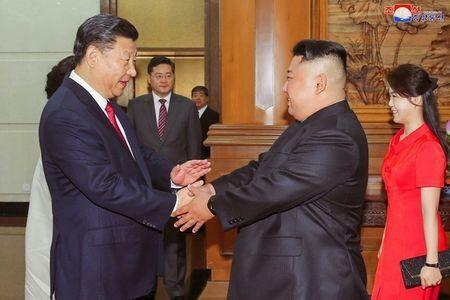 SEOUL (Reuters) - North Korean leader Kim Jong Un and Chinese President Xi Jinping discussed measures to bolster "strategic and tactical" cooperation between the two countries in a second meeting on Wednesday, the North's state media said on Thursday. 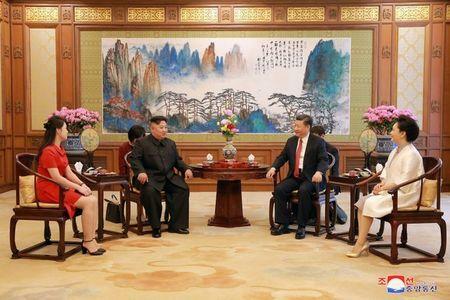 The meeting between Kim and Xi came on the North Korean leader's second and last day of his latest visit to Beijing where he briefed the Chinese president on his summit with U.S. President Donald Trump last week. They exchanged "serious views" on the present and "new" situation, Korean Central News Agency (KCNA) said. On Tuesday, Kim and Xi were reported by North Korean media to have reached an understanding on the denuclearisation of the Korean peninsula after discussing the outcome of the U.S.-North Korea summit. 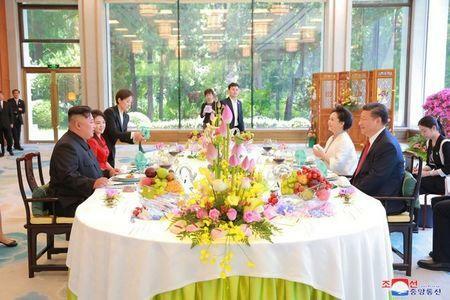 Before meeting with Xi Jinping on Wednesday, Kim visited an agricultural institute run by the Chinese Academy of Agricultural Sciences, KCNA said, where he observed vegetables being grown inside. The North Korean leader also visited a traffic control center in Beijing before departing for Pyongyang on Wednesday afternoon, KCNA said. The visits to the two locations were also reported by Chinese media on Wednesday. Kim Jong Un has pledged to make the economy in North Korea a priority after he had announced the achievement of a long-held ambition to develop nuclear weapons. North Korean media has in recent months, frequently stressed advancements made in its agricultural and industrial sectors.